Our Vegware cutlery is made from CPLA and RCPLA which is recycled PLA, and available in black and white.They are made from cornstarch and not plastic which makes them all completely compostable. We also have our colourful Tutti-Frutti spoons ideal for ice cream and desserts and our new wooden cutlery compliments our range . Our Napkins are all made in the UK. 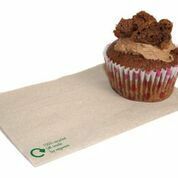 Our 2-ply napkins and made from recycled fibre and are completely compostable they are also unbleached. They offer super absorbency and are soft to the touch. they are available in cocktail, standard or large size. Our 1 ply comes with 2 free dispensers. All made by Vegware so they are all completely compostable too.